I recently got the opportunity to try some Incoco Nail Polish Appliques. Incoco sent me three sets, but I've only worn one so far and I also did a wear test like I have previously with the Sally Hansen and OMG brand strips. What impresses me so much with the Incoco strips is the massive range of designs they have. 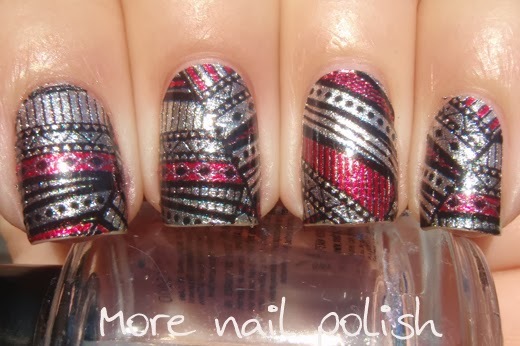 When looking at nail strips I always try to get something that I couldn't easily create using stamping, such as simple black designs on a solid base colour. With Incoco, I had so many choices. 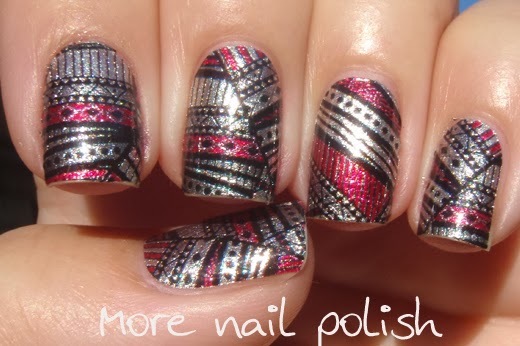 This design is called Tribal Dance and it has a silver foil base with black tribal printing and sections coloured in pink. The strips are very easy to apply, although I am now starting to feel like a bit of a seasoned pro at applying them. They are strong enough to withstand one or two lift offs and repositions without tearing and they a soft and flexible so you can stretch and smooth them out over your nail. I like the fact that each applique is already cut out and loose (just like the Sally Hansen and OMG), rather than stuck to a full sheet (like the Ulta3 ones). 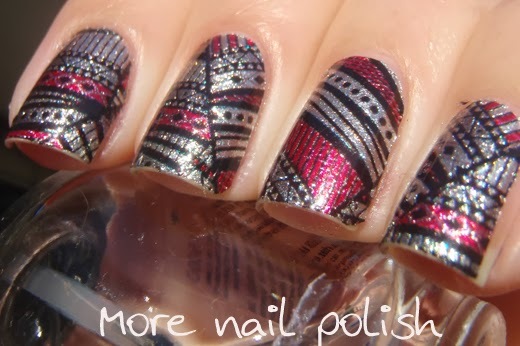 This makes finding the right sized strip so easy, as you can just line it up and wrap it around your nail. The pack comes with 16 nail strips and I was able to find a size that fit every nail without having to cut any down. The instructions say to peel the clear covering off the nail strip before peeling the paper backing off. I actually found it easier to leave the clear strip on the front until I have the nail strip positioned correctly on my nail. I then carefully peel the clear covering off and push the applique down firmly on my nail. The instructions also say that Incoco nail polish appliques contain base coat, colour and top coat, so there is no need to apply top coat. With both the OMG and Sally Hansen brand strips, I felt I needed to apply top coat to seal it all in. This time around I followed the instructions and went top coat free. Without top coat they were still smooth and glossy, so missing the top coat didn't seem too much of an issue. I was particularly interested to see how they would wear without additional top coat applied. Now for the wear test. As a blogger who posts daily, I naturally change my nail polish daily. But I did leave one applique on my right hand for a full seven days to do a wear test. As you can see, the wear is outstanding. By day 7 there was no chipping and about half a millimeter of tip wear. They say can can wear these up to 14 days, and I imagine they would still be ok, except for the regrowth at the cuticle edge. I would have difficulty in saying which of these brands wears the best over a week. I'd certainly be happy to recommend any of these three brands to anyone as they all performed really well. The only down side for me is that because they real nail polish, unused appliques will apparently dry out over time. I did seal my unused strips back up in their sleeve with sticky tape, so I'm hoping to still be able to use some in future skittlette manis. 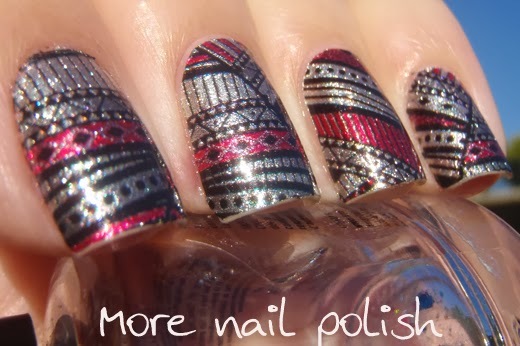 Incoco nail strips are available for purchase through their website and cost $8.99 per pack. They also carry a large range of french tip designs and pedicure designs. If you made it all the way through this post, thank you, and I have a special gift for you. 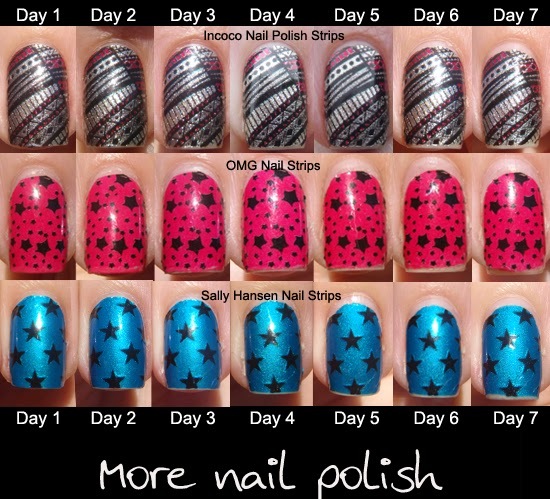 Incoco have kindly offered to giveaway a set of nail polish appliques to one of my readers. The winner will get to choose their favourite design and the appliques will be sent directly from Incoco. write the name of that shade in the comments section of this blog post. I will randomly select a winner from all the entries and post the winner here on my blog. The winner will have three days to email me. Failure to email me will result in a redraw. The winner will receive the shade they commented. Giveaway is open for one week and closes at 12.00 midnight Australian Eastern Daylight Savings time on Tuesday 26 November 2013. Giveaway is open internationally. A great review... :) I can't believe how many designs they have in their range... As someone who is too scared to try water marbling for all the mess, I'd have to say that I would choose peppermint swirl if I got to pick one! Rock Out! is my favorite. Thanks for your blog and for reviewing these! My favorite would be Tis The Season for the upcoming holidays! The range is pretty awesome! There are a lot of sweet designs, but I think Park Guell would have to be my favourite. It's elegant and intricate! So hard to choose, but I'm going to go with Berry Swirl! Just found your blog - now bookmarked! Your pics and descriptions are terrific! Venetian Lace or Perfect Prom Purple are AWESOME. Love them! How to choose!? They all look great. But for my first try at appliques would have to be Total Bombshell! Choices, choices, choices!! I am loving Zig or crown jewels. there are heaps of great designs but i totally love wild card!! thats my fav!!! Garden Party and Rock Out are my favorites but the detailed ones are all awesome. Awesome range! With Christmas coming up I'd go either Deck the Halls or Tis the Season. We used to sell incoco strips at the store I work in YEARS before Sally Hansen jumped on that wagon. They really are the best, I used to use the french manicure ones and get so many comments/compliments. I love the look of Reckless. so many to choose from but First Crush is so cute and my pick! Oh, I think I'd have to go with Wild Card! I would love tickle pink! Thanks for the chance to win. Loved these at first, they do stay on great and last a long time...However, I went back to buy a lot more (180.00 worth) and brought my mother-in-law and she bought a lot too for herself and her granddaughter, etc. Anyway, half of the nail polish bags when we opened to use them were completely useless. The did not stick on the finger(s) at all. There was no stickiness on them and they did not work. To top off a huge waste of time, effort and money, when we took them back to where we bought them, and showed them how they did not stick at all. They told us "that is too bad". And did nothing for us toward their product that did not work. Very disappointing and discouraging. I strongly do not recommend wasting money on this product. Some may stick to your nails, but many, many of them will NOT. That is really disappointing to hear about their customer service! I know that I've tried to keep some of the left over wraps to wear at a later date, but they just dry out and dont stick. Maybe as they get older they dry out and what they sent you was old stock. Poor form on their behalf! I just bought some Incoco Coconut polish appliques this morning. I absolutely LOVE the glow in the dark mini ghosts (for the Halloween season). I'm going to stock up on these for sure!